One of the leading Side Cutting Pliers in the world produced with our high technology backed up with 85 years history and tradition. They are designed with a shorter distance from the fulcrum to bottom of cutting edge, which requires much less power because of the lever principle. 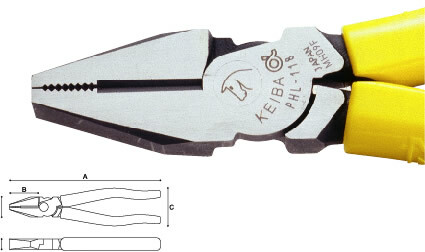 These pliers can cut 3 cored VA cables at one time because of their longer blades. Precisely temperature controlled induction heated blades (HRC61〜64) makes the tool stronger and safer.